If your old burner is giving trouble (not firing, locking out, bearings screeching, guzzling fuel, etc) it may be time for a new one. All you have to do is provide us with the name and model of your boiler and we can supply a new burner which is a match. Your new burner will come with an instruction manual, mounting flange, gasket, electrical wiring, and braided flexible hose - everything needed for an easy installation. 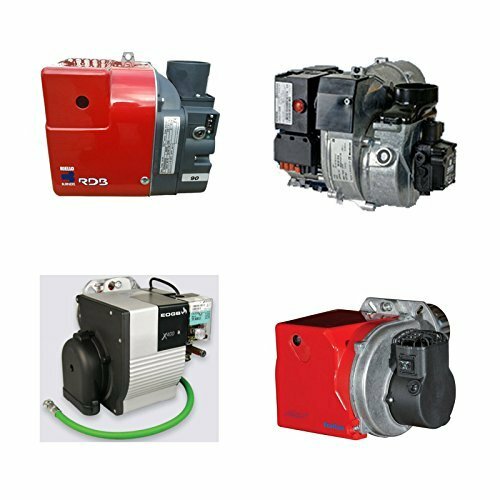 If you are unsure what your boiler model is or what burner you should get just message us or phone us - 028 711 400 24. Our friendly staff will be glad to help you. We have successfully supplied burners for hundreds of customers and all sorts of boilers. At the price shown in this listing we can supply one of the renowned Riello burners, for any boiler up to 36kW. If your property has less than 16 radiators then you will usually not need more than 36kW (120BTU). So, by far the majority of UK homes would fall into this category. A small percentage of properties will require a burner that produces more than 120 BTU / 36kW. We also supply these, at very reasonable prices. Just contact us for a quote (or see our other listings). There are a small percentage of boilers out there where the Riello may not fit. For example, some boilers such as the Trianco 12/14 need a very compact burner because the area where the burner fits is very small. If you think that a Riello will not fit, we recommend that you contact us first. You may need one of our other burners (either Bentone, EOGB or Ecoflam) and we'll be able to advise you.